These two tortoiseshell cats are Cookie and Kelly, both rescued and fostered, but who ended up staying with me for most of their long lives. They were both inspirations for many works through the years, but this set of linoleum block prints is actually my favorite depiction of them. Well, everyone knows a fat cat who knows she’s beautiful, and Cookie would tell you that a woman with a round shape was once most desirable and an object of worship. That’s why I call her “The Goddess”. From the time I first described this idea to someone, who chuckled at the idea of the image, I knew Cookie was a winner. And through the years she has continued to bring people and stories to my display no matter where I am—everyone knows a cat who looks like Cookie! Sometimes when I look at Kelly the only feature I can distinguish in all those tortie markings is her extremely round eyes. 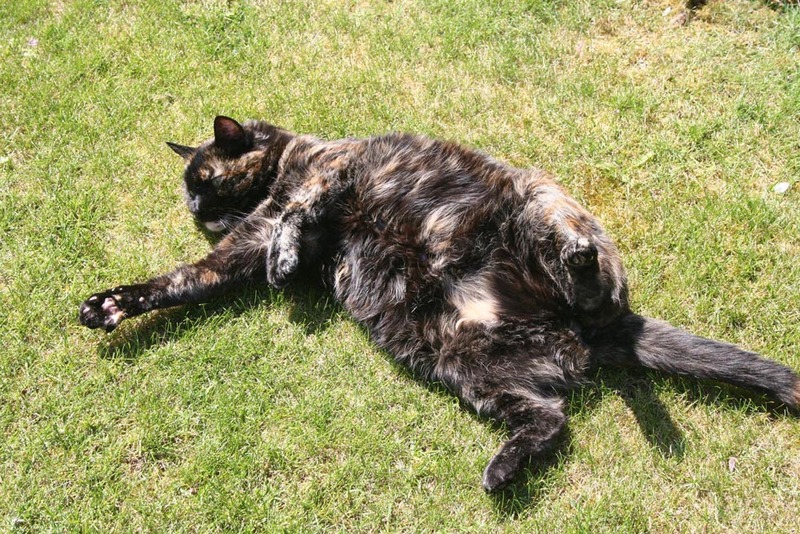 And then others tell me tales of their slender round-eyed torties! I’ve printed these girls on many things and am constantly creating new unique items like serving trays and tablecloths. Click below to see what’s available now, or scroll down and read more about the prints and the girls. 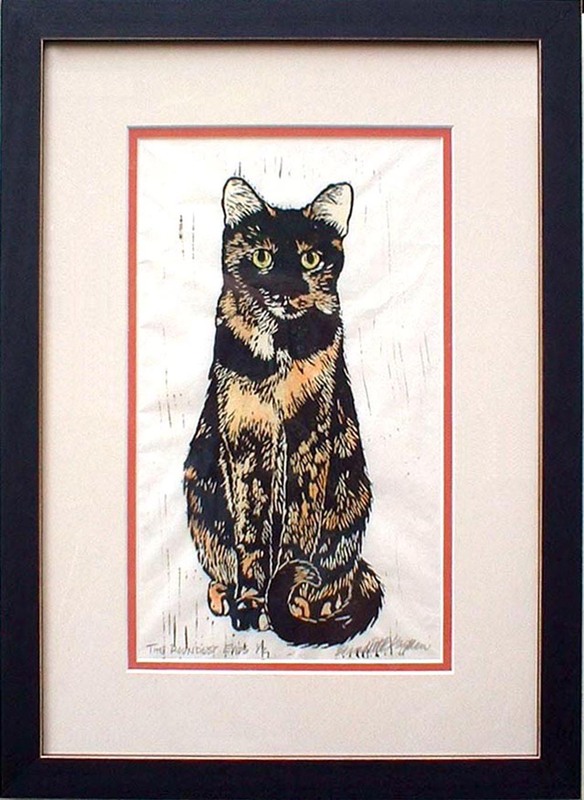 “The Roundest Eyes” is a hand printed, hand tinted linoleum block print of a very slender tortoiseshell cat with very round eyes, matted and framed and ready to hang. Image is 8″ x 12″, with mat and frame outside dimensions 11″ x 14″ or 16″ x 20″. “The Goddess” is the other print in this set. 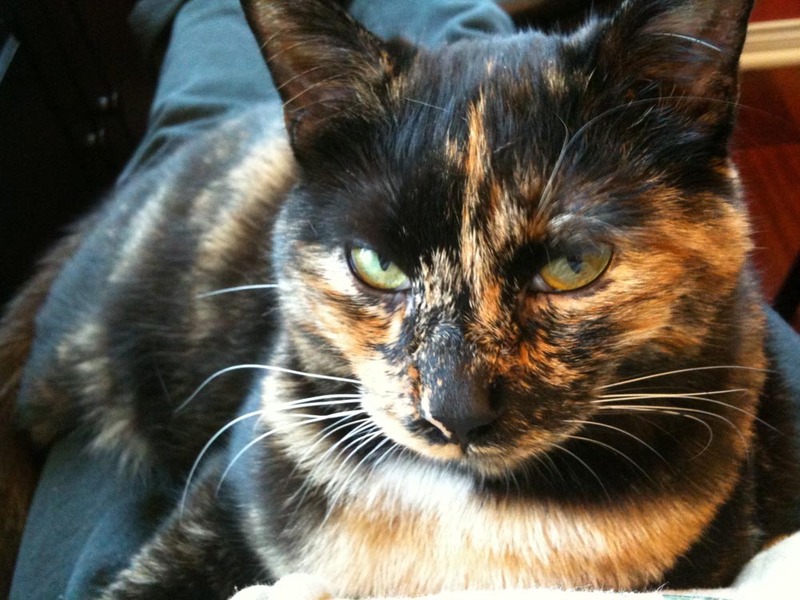 As you know, I am unendingly inspired by my houseful of felines, especially my Tortie Girls. I initially designed these in 2001 because I wanted something I could print myself on a variety of things to offer inexpensively for sale and for donation; at the time high quality home printers and inexpensive digital printing were a few years in the future and all I had to offer was original art and expensive giclees. Unlike many of the other prints I sell, I print these by hand from a hand-cut linoleum block, then each print is hand-painted in watercolor, and with the slight variations in the printing process and the individualized coloration each print is just as unique as torties themselves. “The Goddess”, featuring Cookie, is the other print in this set, and I have more information on her, below. 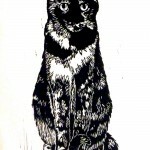 What enchanted me first about block prints years ago, and what I wanted most to see when I began creating with them, was the clarity of black ink on white rice paper. 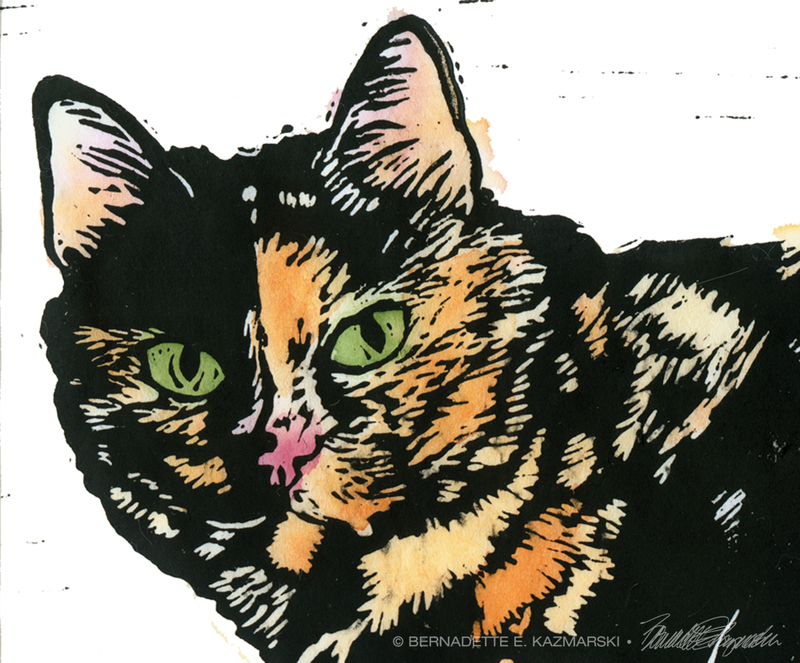 While I often use other colors of ink and types of paper, and when the image is my tortie girls, usually also tinted with oranges and yellows and green for their eyes, pink for nose as I had designed, the black on white is what I usually return to. When I initially print these two they are that familiar black ink on white, and I watch the ink reveal all the cuts and trims I made on the surface of the block to create their image, it makes me smile as I remember designing the prints and cutting the blocks, and I remember my girls and the inspiration they gave me. In designing the set, I didn’t have a signature photo of Kelly as I did Cookie lying on the floor, but I did know how I thought of Kelly—sitting at attention, paws and tail neatly placed, a little uncertain and with very round eyes. When I pictured her, this was what I saw. I began with a few photos of Kelly sitting in this position—in the days before digitals so I had to wait for film to be developed—sketched it out, then filled in the details by observation. It was a real trick since Kelly never sits still for too long. And I actually wanted two different orientations so Cookie was the horizontal image and Kelly the vertical one. The design of “The Roundest Eyes” doesn’t have a long and detailed story as does “The Goddess”, but between the two, while Cookie gets more notice and stories which I’ve collected over the years, Kelly sells more t-shirts and prints…we just never let Cookie know that. Last year a young couple just getting engaged purchased one of each shirt to wear in their engagement photos too! 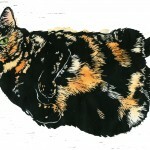 To a certain extent I can take an untinted print and hand-tint it to resemble your favorite tortie. I can’t remove any of the black that is there or paint over it, but I’ve done several to date. Here are examples of how I customized “The Goddess”. “We got Rosie when I was 11. My dad told me we were going to mum’s boss’s house to pick something up and asked if I wanted to go with him, and as Annie, the boss, had two ginger cats my sisters and I loved to play with I went. When I got there I saw a tiny purring little bundle of fluff and claws and played with her for about an hour. Then dad came in and told me to pick her up, we were going home! “15 years later, and we’ve moved to another city. Rosie is still going strong, mum had a terrifying moment a few years ago when she felt a lump in Rosie’s belly and [went] to the vets with the instructions to not allow her to be in pain….The vet sent her back with a packet of diet cat food. She’s a wonderful purry old thing, with a beautiful temperament—she had to have one to grow up in a house of 3 little girls and all the neighbourhood kids! 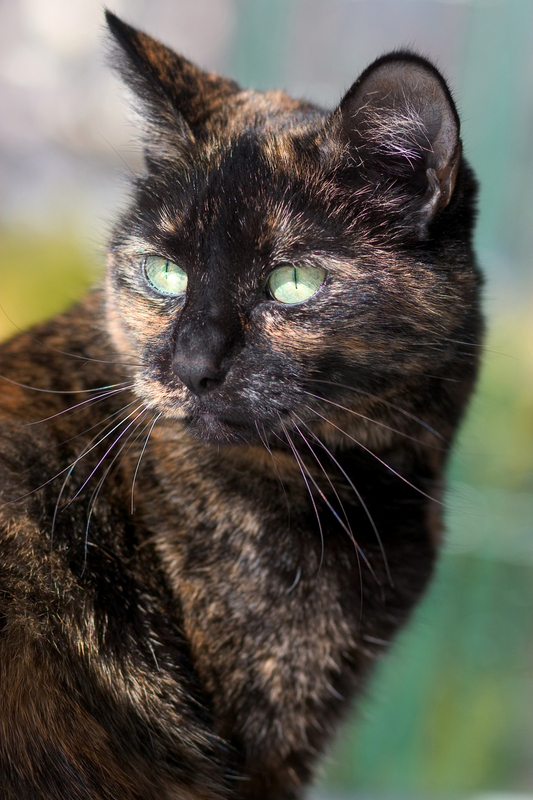 I love a good rescue story, and I am always heartened by the stories of rescues and so much love that people share about the torties who share their lives. A customer ordered this matted and framed print a few days ago. I received the notice in e-mail, then just a few minutes later I received an e-mail from that customer with a photo attached. 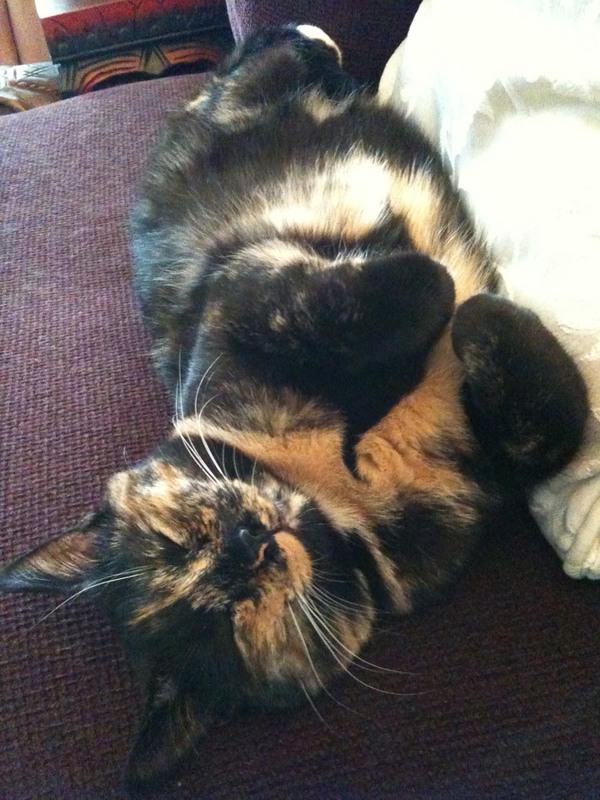 Java, a beloved tortie cat. Java is lovely with those pale green eyes and lots of speckles all through her fur, and a very direct and focused expression. Torties are unique not only in markings but also in purrrsonality, and whether they be the ones who make it clear they are the boss or, like my Cookie and Kelly, are non-stop sweet, they are devoted and demand your devotion in return. 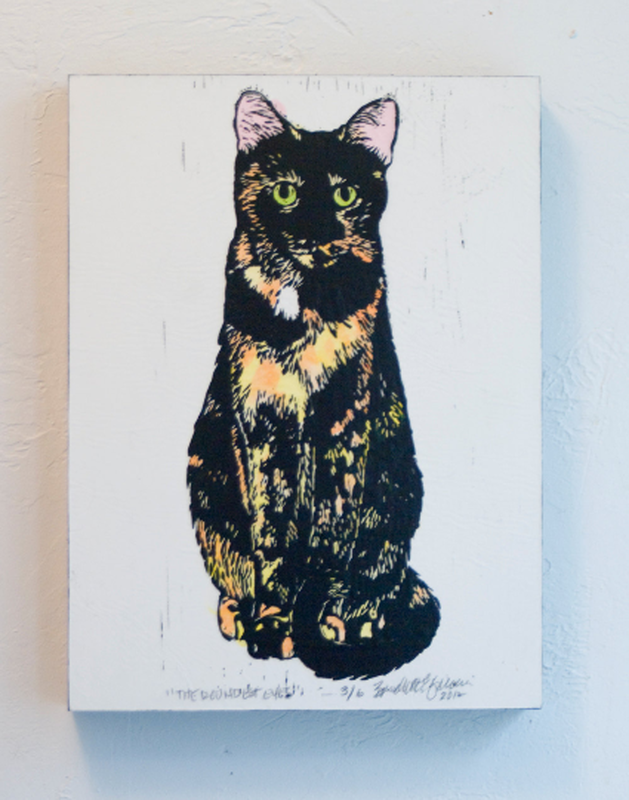 I’m always sad at the loss of a kitty and couldn’t be more honored than for someone to purchase a piece of my artwork as a permanent memory of a beloved cat. I was very touched for Java’s human to send Java’s photo and her note along with her order and I asked if I could share Java’s photo and her note. It warms my heart, as I remember Kelly and near the first anniversary of her passing, to know that her Kelly’s image is traveling off to another household to provide comfort and love. I promise my cats they will never be forgotten and I always hope my art ensures that. 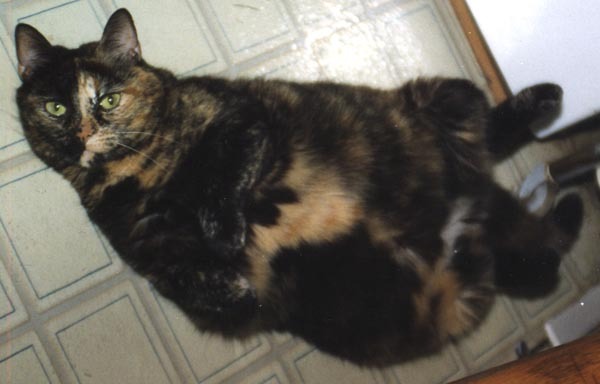 My sympathies to Java’s human, I know that she will be one of the torties I think about when I look at prints of The Roundest Eyes. 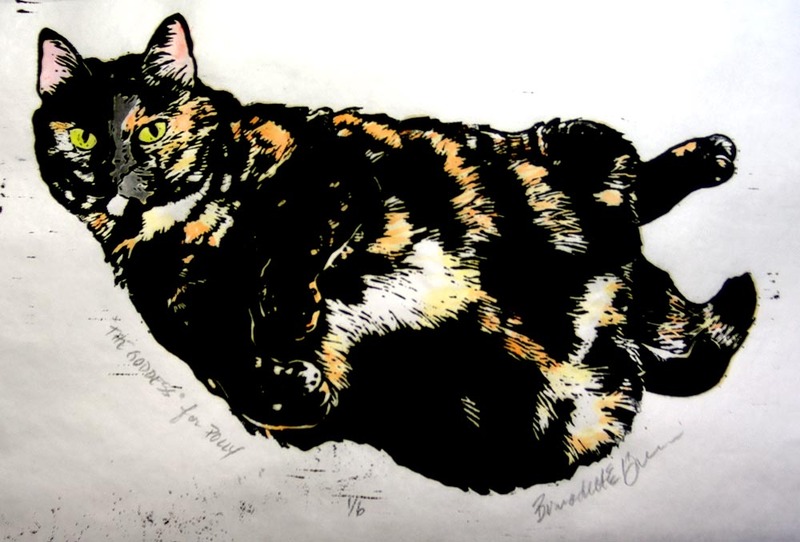 “Tortie Girls” are hand printed, hand tinted linoleum block prints of my two tortoiseshell cats, one very round and one very slender, “The Goddess” and “The Roundest Eyes” matted and framed and ready to hang. 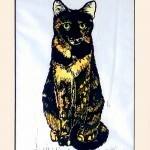 Image is 8″ x 12″, with mat and frame outside dimensions 11″ x 14″ or 16″ x 20″. You can read more about the girls and the prints below. 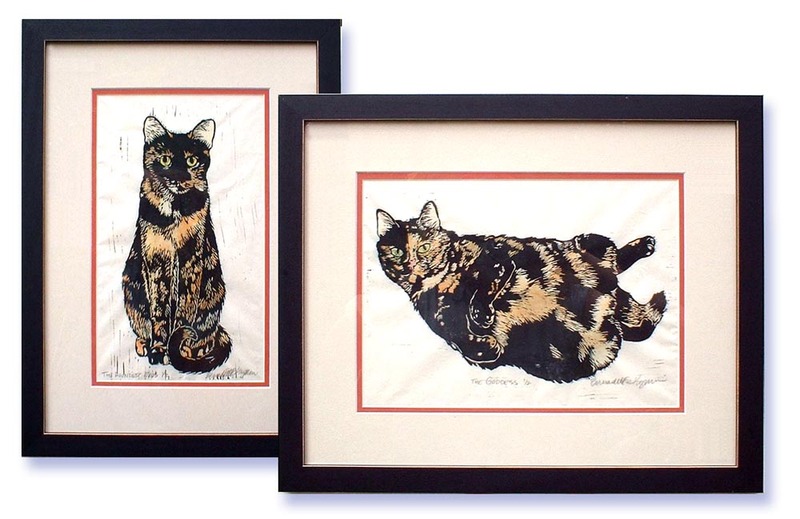 “Tortie Girls” set of matted and framed block prints. 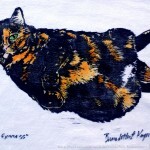 And see the whole collection of prints, tees, trays and table linens on The Tortie Girls Linoleum Block Prints. “The Goddess” came along first and I actually have photos of the process, but I knew right away she’d have to have a companion print. I looked at Cookie on the kitchen floor, on her back with her toes curled, a defiant look on her face, and it happened—that moment of visualization. I could see a linoleum block print in black ink on white rice paper, hand-tinted with oranges and yellows for the patches in Cookie’s tortoiseshell fur and green for her eyes and pink for her nose. I would call the print “The Goddess” for the many women depicted with generous figures in sculpture and painting through the millennia. From the time I first described the idea to someone, who chuckled at the idea of the image, I knew Cookie was a winner. And through the years she has continued to bring people and stories to my display no matter where I am—everyone knows a cat who looks like Cookie! Linoleum block for The Goddess, of course it’s in reverse. Cookie inspired not only a design, but a particular style and technique and a new element to my creative life and my merchandise. With an inspiration that strong, I probably would have done it anyway, but I had other reasons as well. 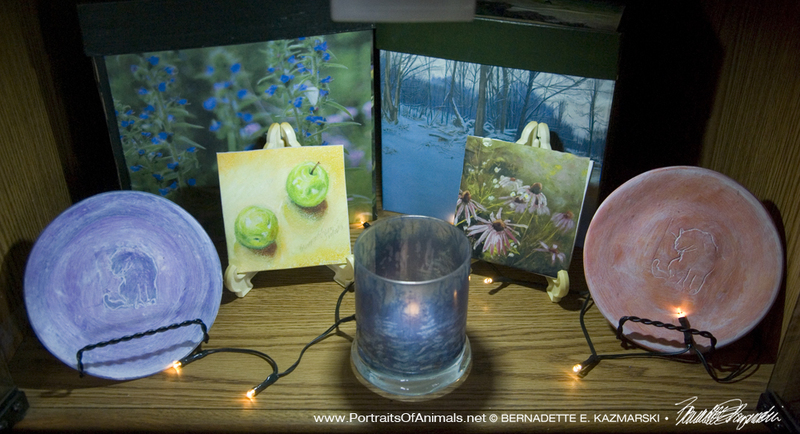 In the late 1990s having my sketches and paintings reproduced was still expensive and not always successful and I wanted artwork that I could reproduce easily and inexpensively myself so that I could have something more affordable than original artwork to sell in my displays. 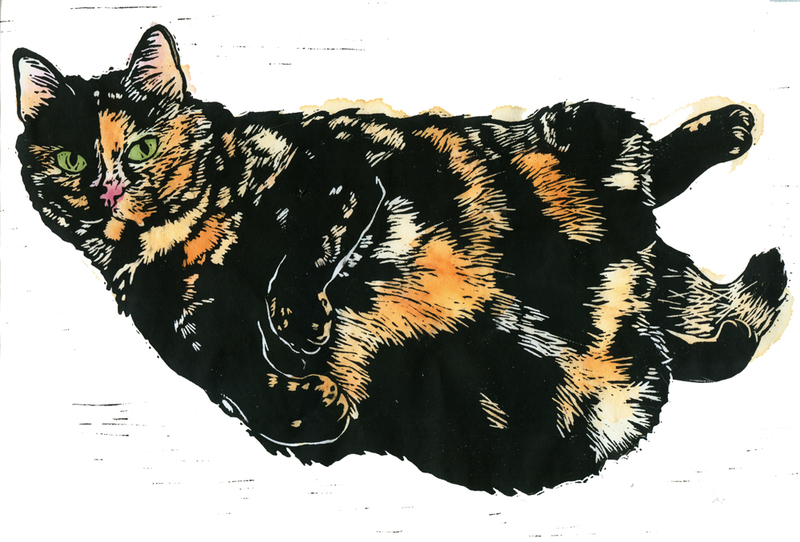 I’d worked with small linoleum block prints for years and always enjoyed the medium, but this time I decided I wanted something larger and I might actually create a series—which led to “The Roundest Eyes” depicting my other tortie, Kelly, a few months later. Between the two, Cookie gets more notice and stories, but Kelly sells more t-shirts and prints…we just never let Cookie know that. Capturing all Cookie’s freckles and spots and stripes was indeed a challenge, especially when I went to actually cut them out of the surface of the linoleum block. Cookie’s face from the photo. 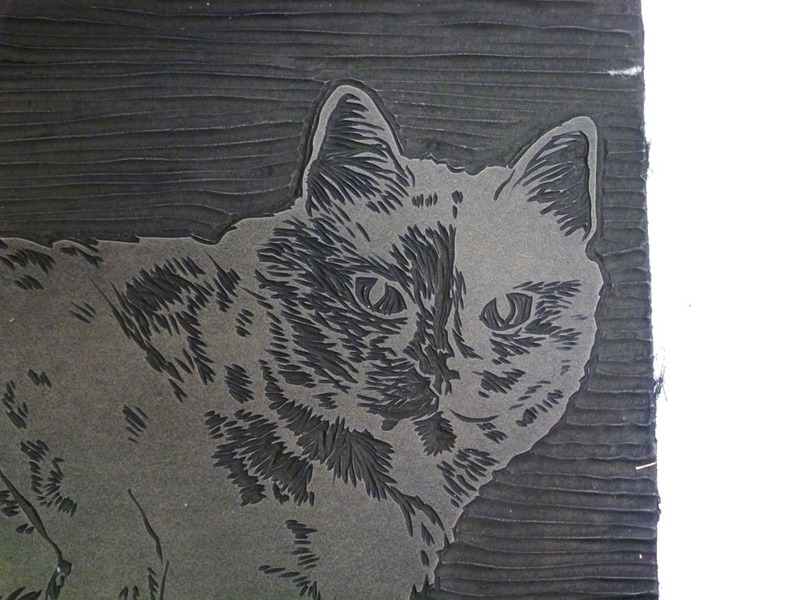 Closeup of Cookie’s face in linoleum block; the light areas are the smooth surface that holds the ink. And here is Cookie’s face, printed and colored! Closeup of Cookie’s face from “The Goddess”. “The Roundest Eyes,” matted and framed hand-tinted linoleum block print. 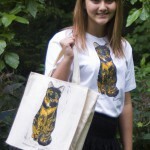 To a certain extent I can take an untinted print and hand-tint it to resemble your favorite tortie. I can’t remove any of the black that is there or paint over it, but I’ve done several to date. 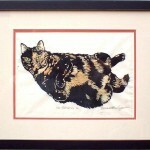 A customer ordered a print of “Dinnertime” along with an unframed hand-tinted print of “The Goddess”. I told her the story of Cookie and she told me the story of Tasha, below. Now there’s a cat guy! 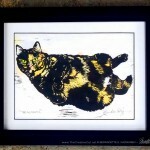 He gets a print of a tortie and three cats eating for his anniversary present, reminiscent of the cat he rescued. I love knowing my girls have a share of immortality when their prints go off to live in other homes and celebrate other tortie cats. 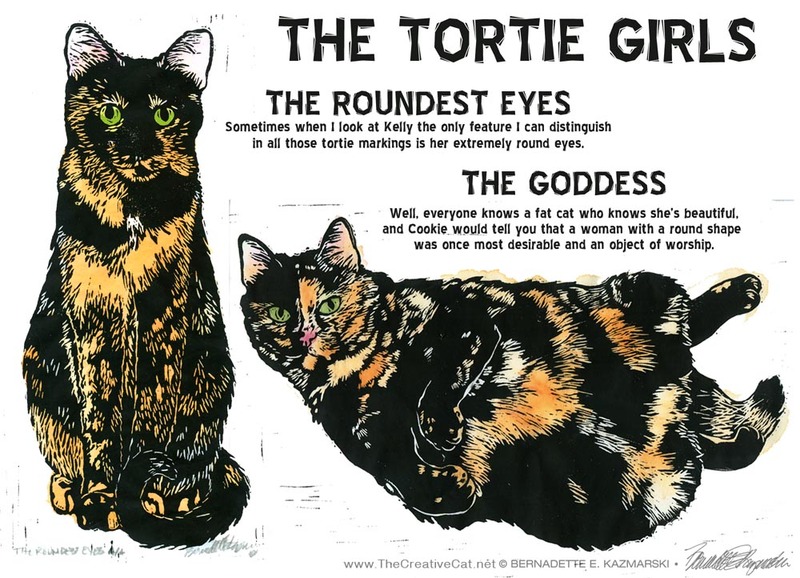 You can also read a list of other tortie stories I’ve collected at shows and festivals when people see “The Goddess” especially in “The Goddess Truly Inspires” and “The Artist’s Life: Still Inspiring” as well as “Featured Artwork: The Roundest Eyes”. 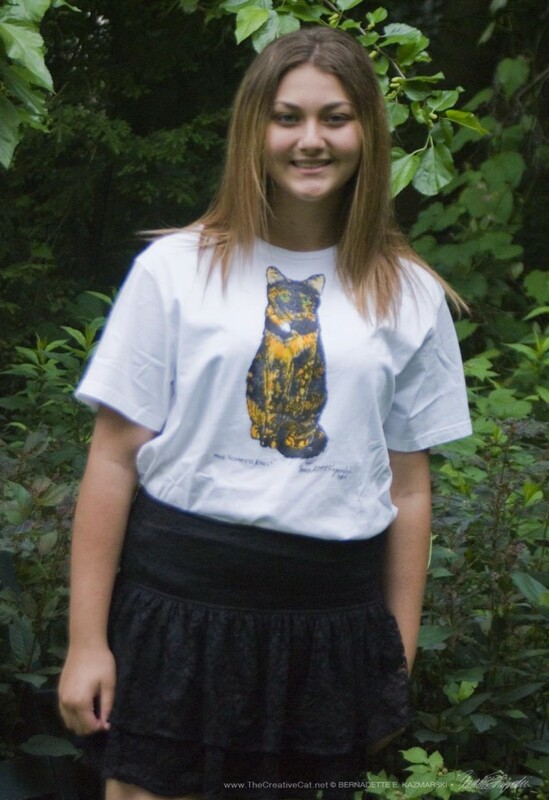 Kitty’s mom ordered a tee to remember Kitty. SadieCat relaxing among the library books. 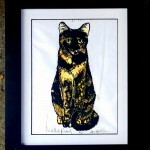 SadieCat’s mom bought a hand-colored print for herself as a birthday gift. “…I especially love the pictures of the tortie cats. 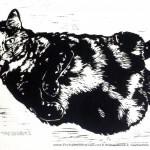 When I saw the block print of “The Goddess” my heart stopped. Three years ago I rescued a starving little kitten who soon became the love of my life. I couldn’t help myself from attaching a couple of pictures of SadieCat (seen here). Someplace I have a photo where she looks exactly like your print, but I couldn’t find it. Visit the original post, The Goddess Truly Inspires, to read more stories and to add your own. 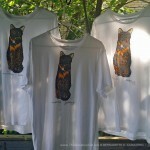 These white cotton tees are hand-printed with a linoleum block print, hand-painted to resemble the coloring of my tortie girls, Cookie and Kelly. 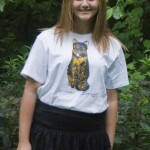 I will note that this style of shirt runs small, so order a size larger than usual. 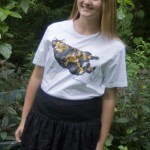 I have limited sizes which are all in the drop-down list for ordering. Pairs nicely with a Goddess tote. 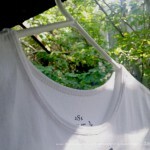 Tees drying on a summer afternoon. Well, everyone knows a fat cat who knows she’s beautiful, and Cookie would tell you that a woman with a round shape was once most desirable and an object of worship. Not everyone has the room for, or the use for, art on their wall, and I designed these block printed works to be versatile. 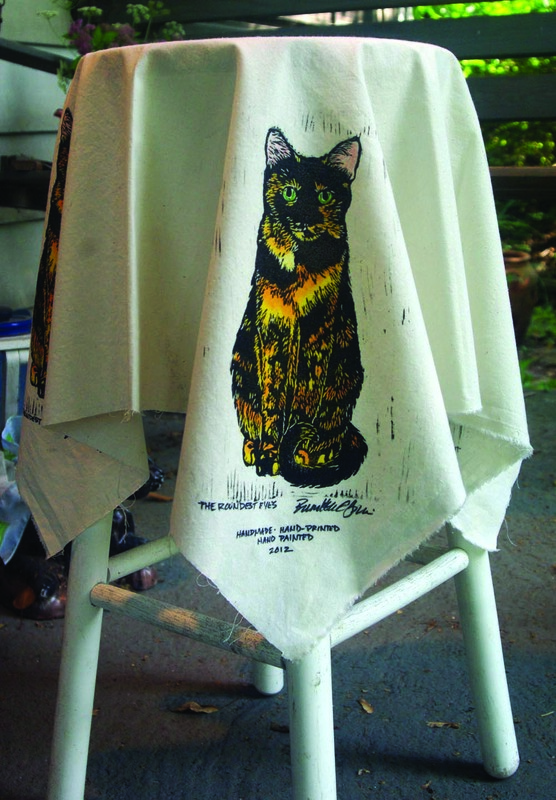 I do offer them as prints on paper, but I’ve also printed them on sweatshirts, curtains, placemats, tote bags and so on—whatever will hold still long enough for the ink to dry. 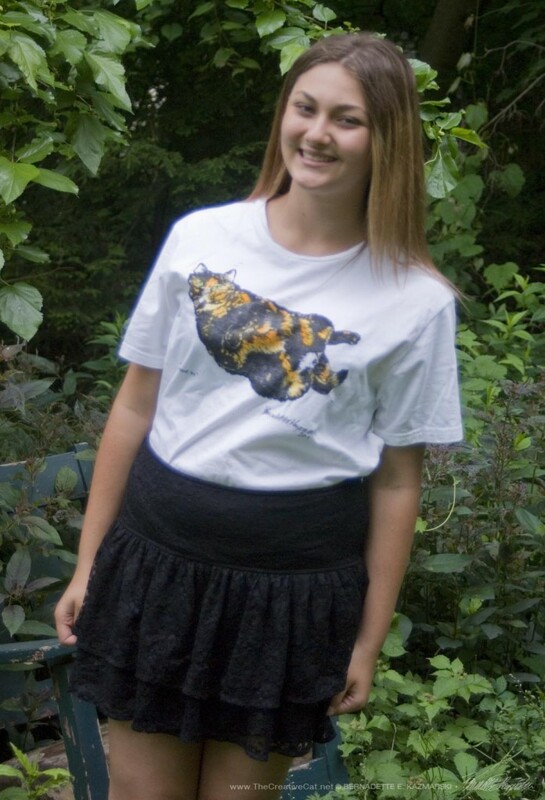 The black portion is printed in ink, then I go back into the prints and hand tint the shirts by painting ink into the design so that the color stays more durable through washing. I sign and number each shirt, just as I would a print on paper. 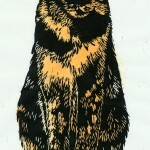 Because of the nature of the medium, each print is unique and ink coverage varies by the surface. 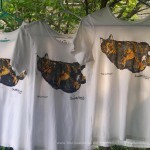 Most artists consider this random activity to be part of the process of creating an individualized print, and along with the hand-painting makes a unique wearable work of art. Fabric is lightweight 100% organic African cotton and made in Tanzania bought in a huge lot by Dharma Trading to support their artisans. Shirts are styled with a more open neckline featuring narrow trimmed edge, slightly shorter sleeves and a little more fitted than the average unisex tee, but sizes still run true. I offer shirts in sizes S-M-L-XL. 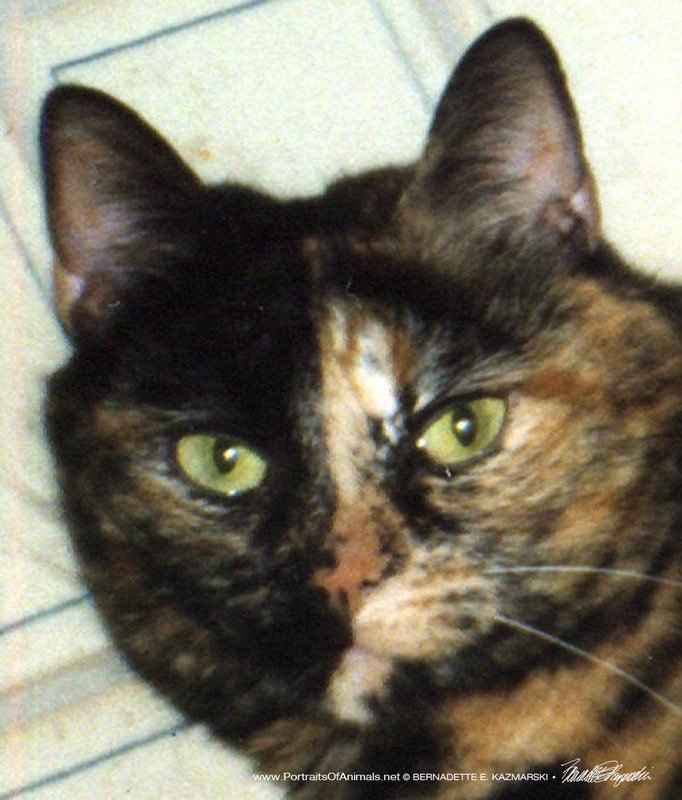 I am unendingly inspired by my houseful of felines, especially those two tortoiseshell calicos, Cookie and Kelly. The framable prints, T-shirts and textiles are printed by hand by the artist from hand-cut linoleum block, then each individually is hand-tinted in bright tortie colors. A few tees drying on a summer afternoon. Pairs nicely with a Roundest Eyes tote. 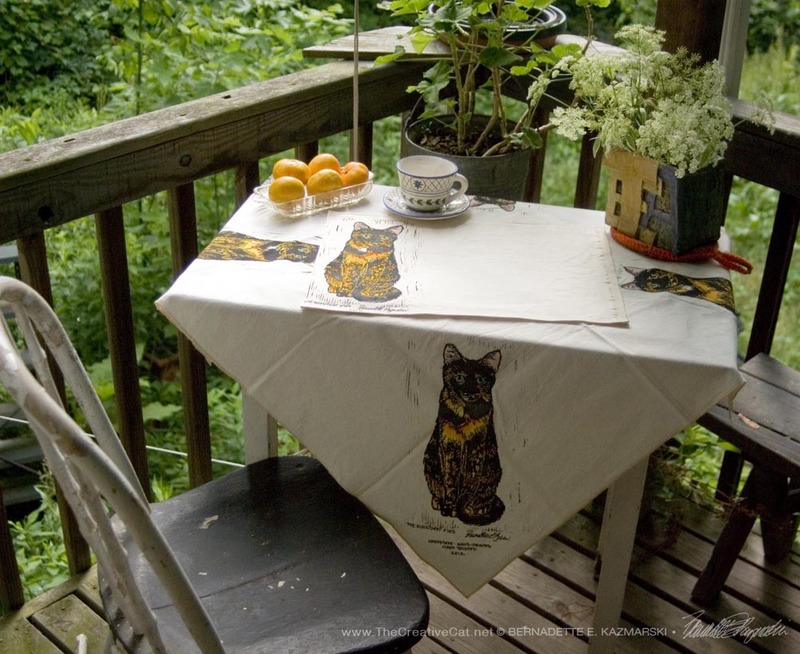 Made of unbleached cotton muslin, this little accent tablecloth is 36″ x 36″ and has the same image printed four times, one on each side. 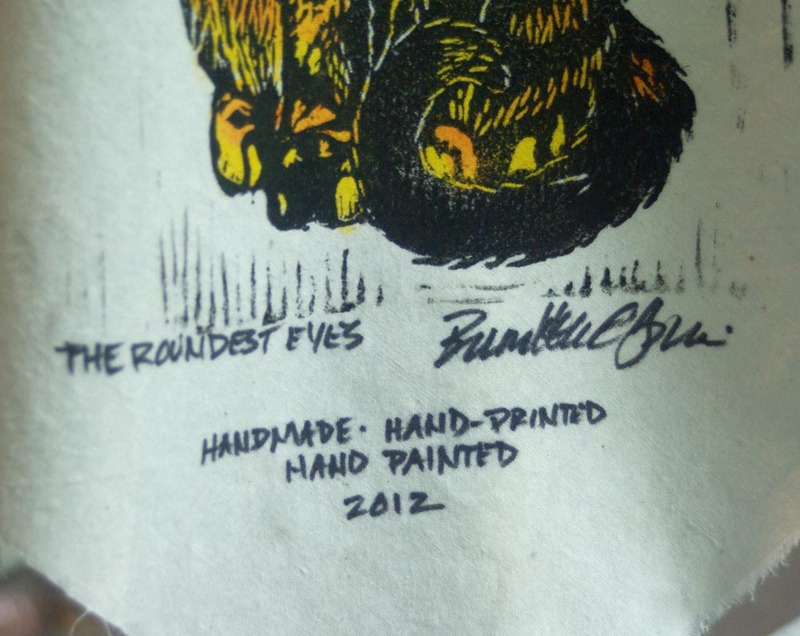 It is signed and dated below the design and has my handwritten “label” reading “handmade, hand-printed, hand-painted” and the year. Washing instructions are included on a separate tag. I only have one tablecloth. Someday I’ll print some more. Looks great with The Roundest Eyes tablecloth. Because of the nature of the medium, each print is unique and ink coverage varies by the surface. 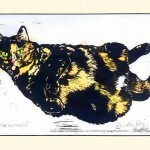 Most artists consider this random activity to be part of the process of creating an individualized print, and along with the hand-painting makes a unique work of art. 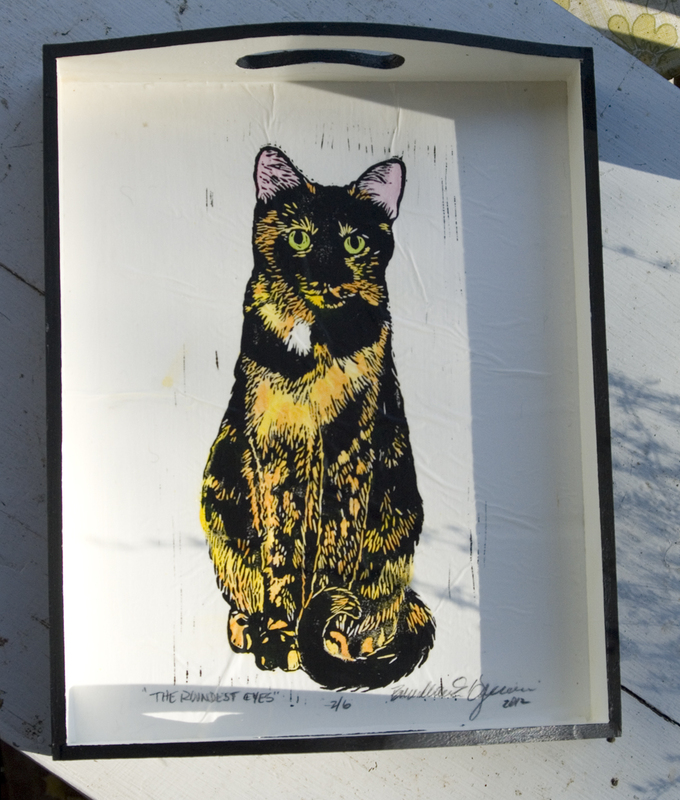 These are lightweight 10″ x 13″ pine wood trays each with a hand-colored and signed block print of my tortie girls, “The Goddess” and “The Roundest Eyes”, adhered in the bottom. Inside of the tray is painted pure white, outside and upper edge is painted pure black with a matte finish on the entire tray. Tortie Girls tray, The Goddess. Tortie Girls tray, The Roundest Eyes. 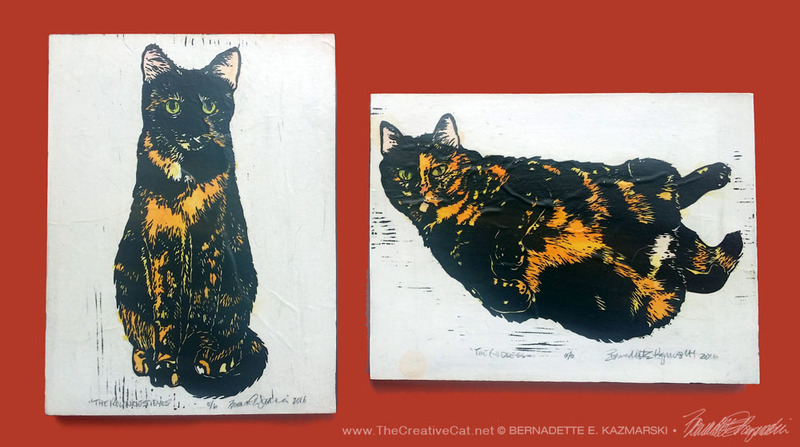 I usually print about a half-dozen of each block print in acrylic ink on rice paper, allow them to dry, and hand color each one individually with watercolors so I have them on hand. I sign each print when the embellishment is complete and store them in an acid-free sketchbook for framing or whatever else I may use them. Then I give each tray a light sanding and paint each tray with acrylic paint. I trimmed down the finished, colored print to fit inside the tray and adhere it into the bottom of the tray with acid-free mounting adhesive. Later I’ll add one coats of finish on the inside of the tray to protect the print. The trays are good for decoration on a tabletop or wall, or to use to actually carry lightweight items but are not suitable as a hotpad or to carry heavy dishes or other items. If kept in direct sunlight the watercolors will fade in time but the inks and paints will not. They can be easily wiped down with mild detergent or diluted all-surface cleaner but not immersed in water. The trays are handmade and may vary slightly in size and shape or have slight imperfections. You may see some paper wrinkling in these prints in the trays; the rice paper tends to pucker up when the ink dries with printing, then again when I watercolor them. I actually iron them to stretch them, but they are never entirely flat. I had originally wanted the prints to look as if they were printed on the trays themselves though that is impossible with the block printing technique, but I think the paper wrinkles adds an interesting element of texture to the trays. 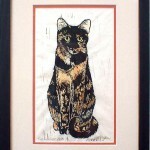 See other gifts featuring my Tortie Girls. 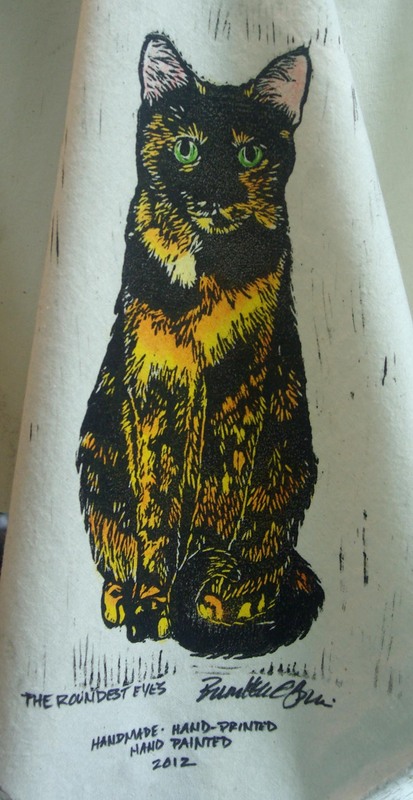 Block printing is a technique wherein the artist carves the surface of a piece of linoleum, leaving raised areas which will become the image. Ink is rolled onto these raised areas, then a piece of paper is pressed against the block and when it’s lifted away the ink remains, leaving the image on the paper. 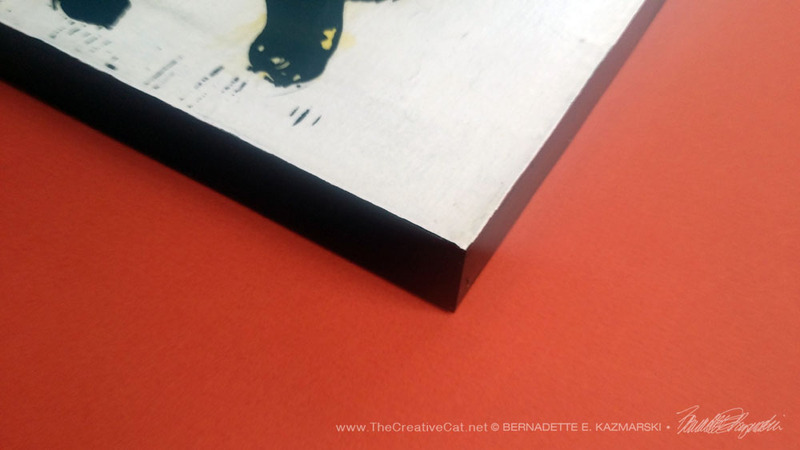 The 9″ x 12″ block, originally intended for painting, is a 1/8″ birch wood panel “cradled” with a 1″ tall canvas stretcher added to the back for strength and stability and, incidentally, ease of hanging, and this size can even stand up on a tabletop. 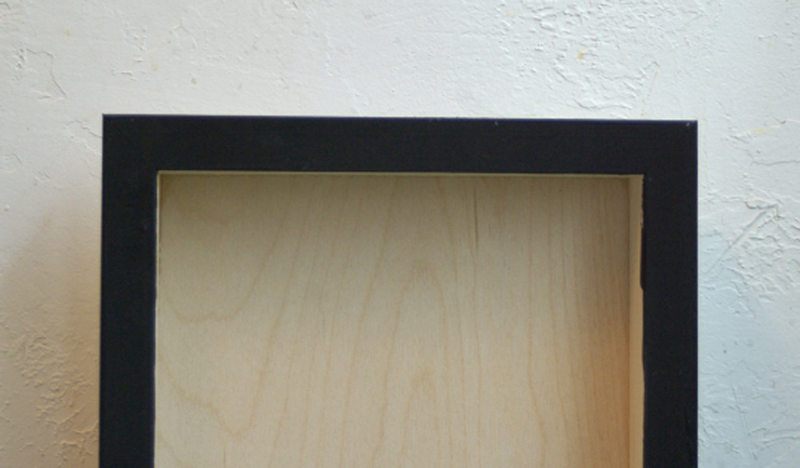 I’ve painted the sides black and mounted a print edge to edge on the top surface, then covered it with acrylic finish. I offer “The Goddess” and “The Roundest Eyes” individually as well as in a set. 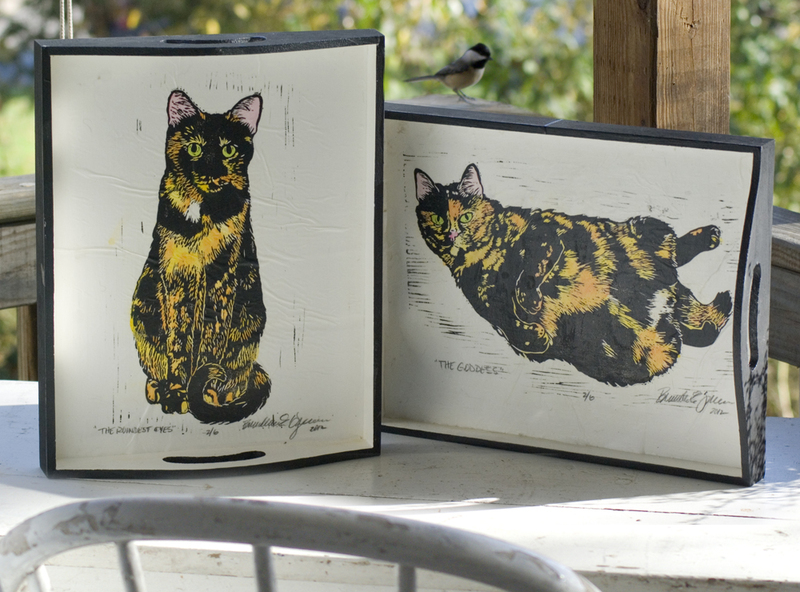 Set of Tortie Girls wood-mounted prints. 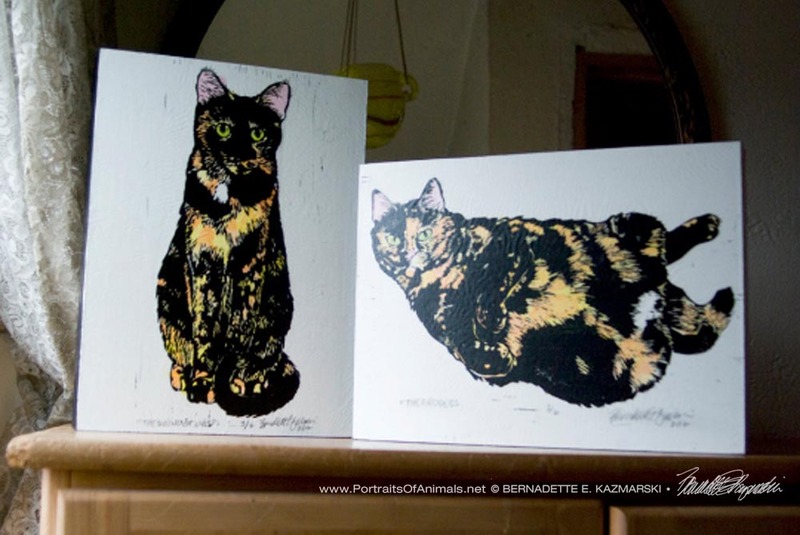 Wood-mounted Tortie Girls prints on a color-coordinating wall. “The Roundest Eyes” wood-mounted print. Edge of the mounted print. Back of the mounted print. 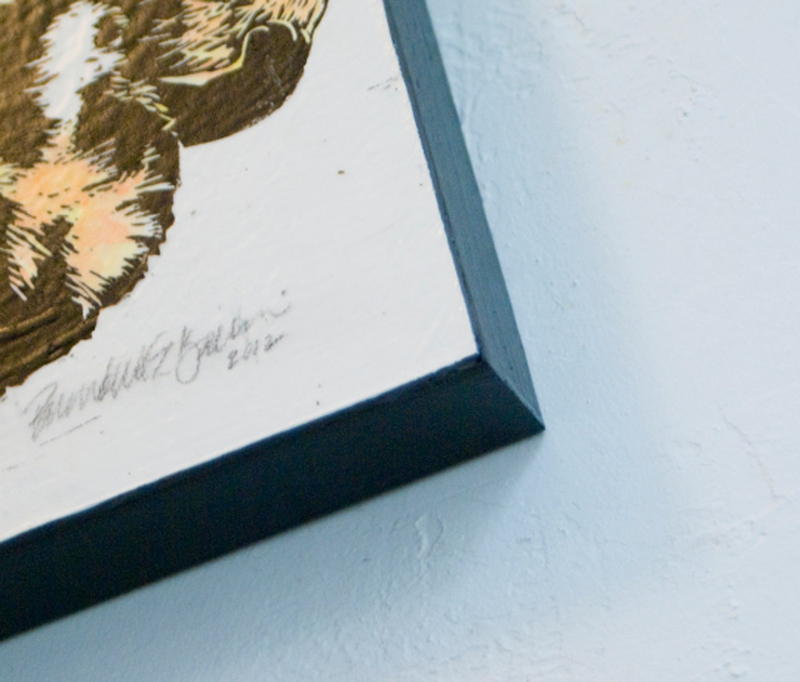 The prints are hand-colored and signed block prints of “The Goddess” and “The Roundest Eyes” adhered to the surface. I first print the block print in acrylic ink on rice paper, allow it to dry, and hand color each one individually with watercolors. Then I sand and paint the block with acrylic paint, black on the sides and white on top. I adhere the finished, colored print onto the block and let it dry, then put a coat of matte-finish acrylic on the top and sides. I usually print about a half-dozen of each block print in acrylic ink on rice paper, allow them to dry, and hand color each one individually with watercolors as I need them, and store them in an acid-free sketchbook for framing or whatever else I may use them. I sign and number each print when the embellishment is complete. The blocks are handmade and may vary slightly in size and shape or have slight imperfections. You may see some paper wrinkling in these prints; the rice paper tends to pucker up when the ink dries with printing, then again when I watercolor them. I actually iron them to stretch them, but they are never entirely flat. I had originally wanted the prints to look as if they were printed on the trays themselves though that is impossible with the block printing technique, but I think the paper wrinkles adds an interesting element of texture to the trays. 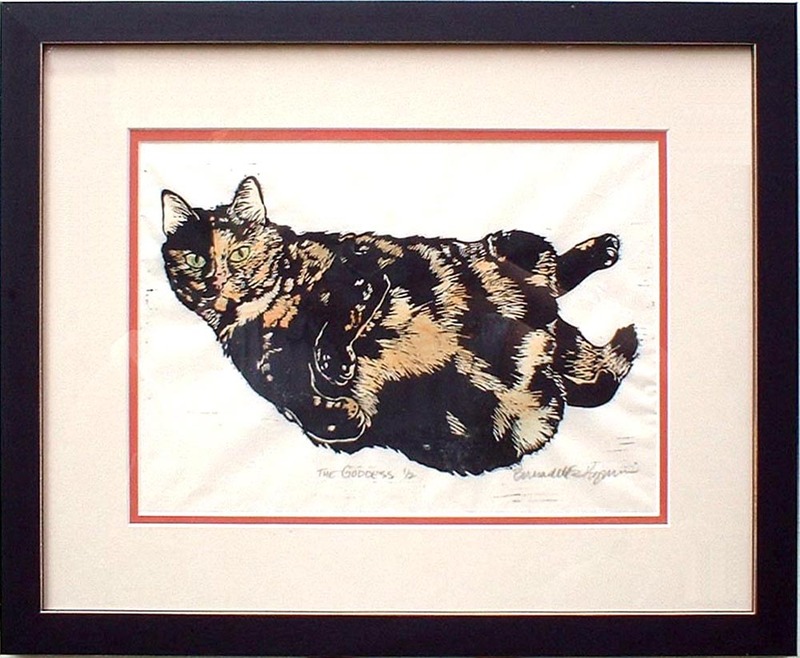 “The Goddess” is a hand printed, hand tinted linoleum block print of a very round tortoiseshell cat, matted and framed and ready to hang. Image is 8″ x 12″, with mat and frame outside dimensions 16″ x 20″. “The Roundest Eyes” is the other print in this set. 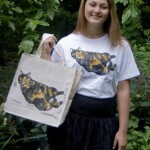 Also scroll down to read about customizing your tortie print. 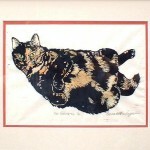 Above is a hand-printed linoleum block print tinted in tortie colors featuring my Cookie, who was indeed “The Goddess”. 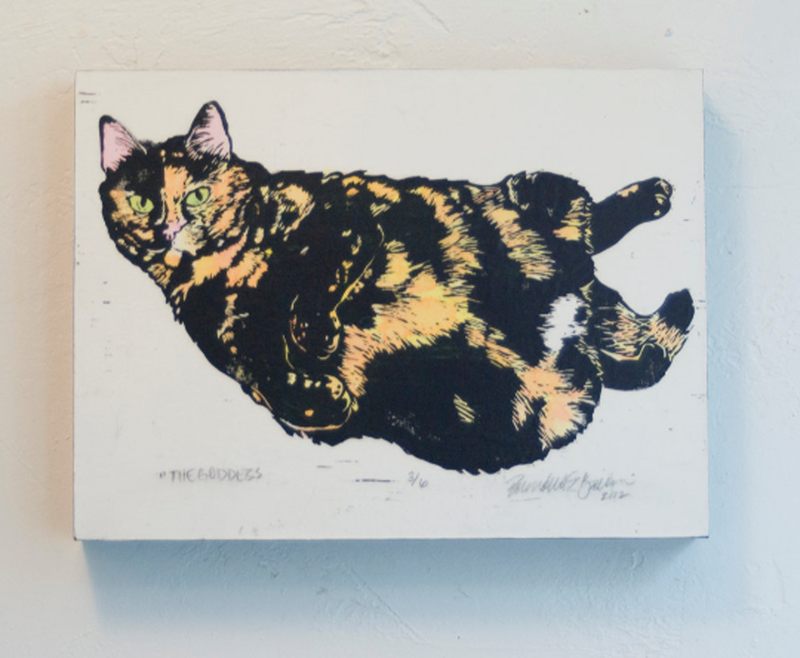 From the very first time I showed the design to someone, and each time I set up a display where the prints are included someone, or several, stops by to tell me about a cat they have “who looks just like that”, and tell me stories and share a laugh. People often tell me stories when they purchase prints as well. The number of them who were rescued always warms my heart. 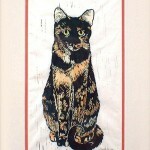 Unlike many of the other prints I sell, I print these by hand from a hand-cut linoleum block, then each print is hand-painted in watercolor, and with the slight variations in the printing process and the individualized coloration each print is just as unique as torties themselves. “The Roundest Eyes”, featuring Kelly, is the other print in this set, and I have more information on her, below. 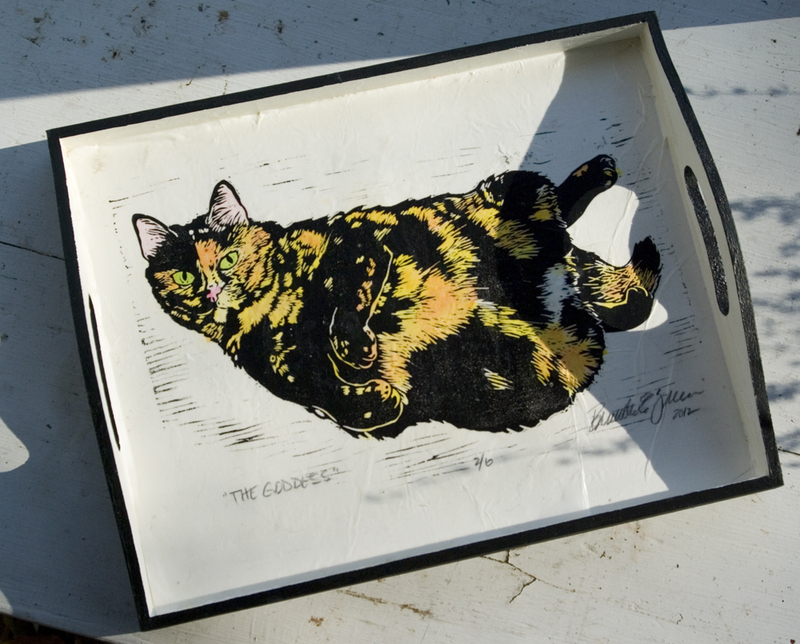 Unlike many of the other prints I sell, I print these by hand from a hand-cut linoleum block, then each print is hand-painted in watercolor, and with the slight variations in the printing process and the individualized coloration each print is just as unique as torties themselves. “The Goddess,” hand-tinted linoleum block print. “The Roundest Eyes,” hand-tinted linoleum block print. I really enjoy working in this medium and I can free myself from the traditional media and a greater realism in rendering. 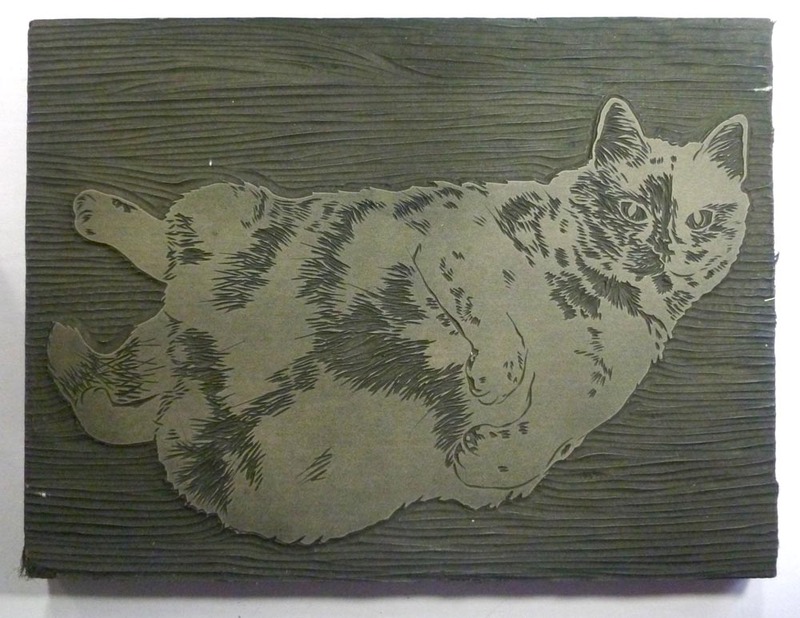 Linoleum block printing is a technique wherein the artist carves the surface of a piece of artist’s linoleum, leaving raised areas which will become the image. Ink is rolled onto these raised areas, then a piece of paper is pressed against the block and when it’s lifted away the ink remains, leaving the image on the paper. The resulting work isn’t a one-time thing, but meant to be printed multiple times–and I do, on just about anything I can think of. They all start out on paper, but they’ve been printed on t-shirts and dresses and aprons and curtains, to name a few things. I nearly always add color to The Tortie Girls with watercolor or dyes since that was part of the original design, and I’ll often add color to other designs to give them extra interest. Because of the nature of the medium, each print is unique and ink coverage is not always perfect. 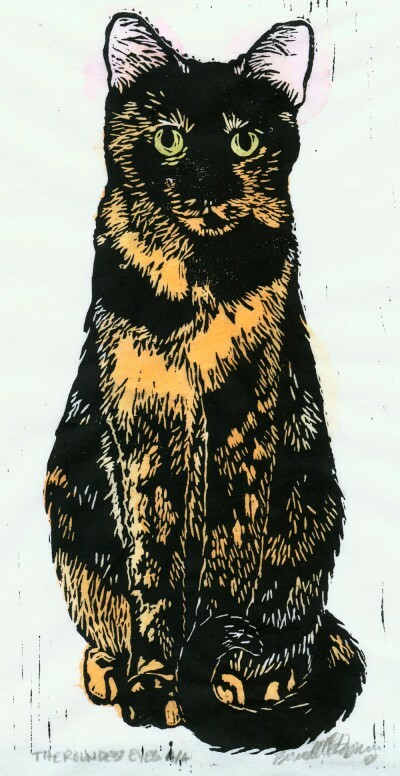 Most artists consider this random activity to be part of the process of creating an individualized print, and along with the hand-painting makes a unique work of art. 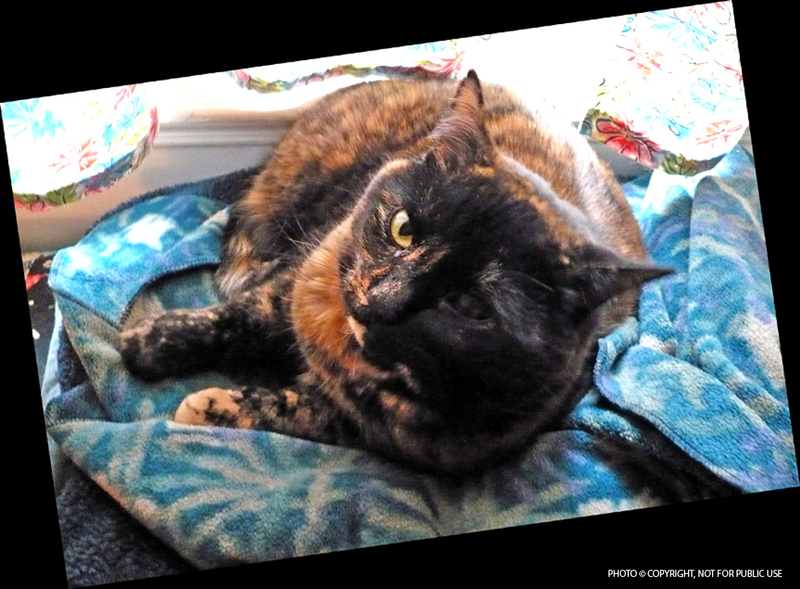 Each image is 9″ x 12″, with mat and frame outside dimensions are 16″ x 20″, but I also offer other frame sizes and the Tortie Girls designs on many other things. Take your time, there's a lot to see! If you're looking for something in particular, use the search box at the bottom of every page. If you have a question, send me a message . My system holds shopping carts for 7 days, so shop around and come back later if need be. Click here to see my current specials.